I admit, this is a rather poor image. Light conditions were not very good, although it was only partly cloudy in Curwensville when I took it. The wedge shape in the sky on the left is pale blue sky. But the image is good enough to explain a few things about the storm. To the right is the body of the storm, called a supercell thunderstorm. Any thunderstorm is caused by warm, moist air rising high into the atmosphere because of heating. As it rises, the water vapor in the air condenses and becomes clouds and rain. Sometimes the wind and rising forces are very strong, causing a strong swirling vortex to form in the middle of the storm. These storms are called supercells. In this photo, you can see the main channel of air on the right half of the sky. These clouds are made of water that is condensing around the vortex. The friction and forces in here made a great deal of lightning. At the top of the picture, you can see what is called the "anvil" of the storm. This is where the uplifted air gets so high that it enters a cold thin part of the atmosphere where strong winds blow it out in all directions. This is somewhere between 35,000 and 50,000 feet. This picture shows conditions about the time of the tornado. The tornado occurred in the red part directly above the letters FIG, which is Clearfield-Lawrence Airport. 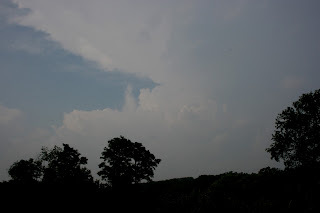 The storm front came through Pennsylvania from the northwest. 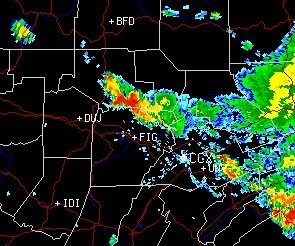 As it approached Clearfield County, the storms were aligned along a single front, almost a straight line. You can see part of the line in the upper right-hand corner of the photo. Notice how the portion of the storm that spawned the tornado has fallen behind the main line. If you are familiar with the geography, you will notice that it has stalled over Bennett's Valley between Weedville and Penfield along State Route 255. 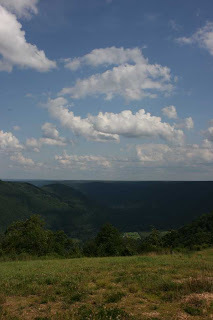 This is a very deep valley with Boone Mountain on the northwest and Penfield Mountain to the southeast. Apparently when the storm came directly across the valley, the face of Penfield Mountain caused the storm to stall and the winds to start spinning up to a great elevation, which eventually led to the tornado. This is not the first time that Penfield Mountain has caused Parker Dam State Park to suffer tornadoes. The same thing happened on May 31, 1985, and you can still see the damage to this day. Have you ever heard someone point out that faith is not just a religious idea, but that all living requires faith? Like how it takes faith to get on an airplane, faith to believe that what you're eating isn't poison, etc. John Calvin pointed something very interesting out in his Institutes about this that I want to share with you. In Book II, Section 1.4, he pointed out that Adam's sin in the garden was an act of faith. When the devil came to Adam and told him that God was lying, and that he would not surely die if he ate, Adam had faith in the devil and believed him. He ate out of faith in the devil's word. God had told him something different, but Adam chose to believe the devil. If your faith is not in Jesus, you are still acting out of faith. Jesus has said that His burden is light, that His commandments are good, and that He will forgive you and give you eternal life if you come to Him. If you have not done that, what sorts of things are you believing about Him? Who are you believing about him? 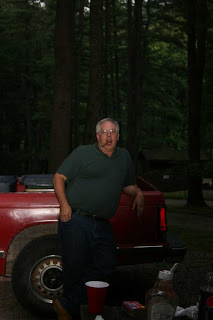 Here's a few photos from the great GRPC camping excursion of 2009 at Sinnemahoning State Park. 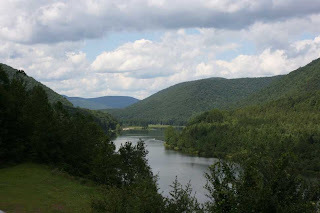 This is George B. Stevenson Lake at Sinnemahoning State Park on the First Fork of the Sinnemahoning Creek. If you look closely, you can see the Winklers and Udes waiting for me while I took pictures from the wrong meeting place. Before we made camp, we went up to Mason Hill, a PGC clear cut on the top of the mountain. Our vehicles made the top of the narrow mountain pass with only a small amount of steam and smoke. This is the view over Driftwood to the east. Here's the first of many educational opportunities we took advantage of during the weekend. 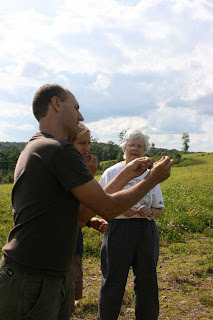 This is Kevin Ude teaching the art of shooting clovers. His students displayed remarkable aptitude. 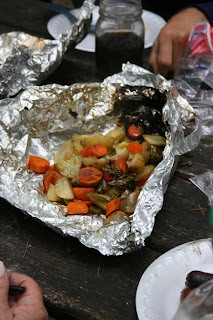 We did hot dogs and veggies on the fire for dinner. Very tasty. 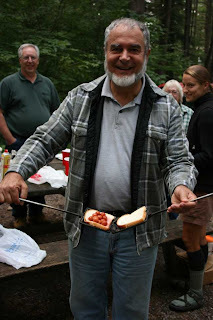 Pastor Charles talked about his mountain pies for about two hours prior to obtaining one. His comment here: "I would really like to share, but its MINE". Here's Don Kark putting the "C" in the PCA. 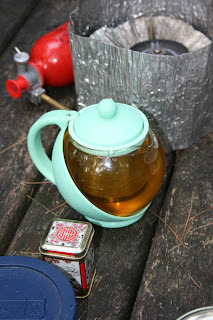 A fine looking pot of tea for breakfast. Alice made it after giving us coffee to "put hair on our chests". It was really a fine weekend- gorgeous weather and great times. We're already planning on it again next year!